Feng Shui-Your Home’s Blueprint Mirrors Your Personal Blueprint – Lidia Kenig-Scher's Musings and Art…Of Course! There is no better means to understand how we are connected to everybody and everything than to examine the blueprint of the place we chose to live in. It may be hard to believe, but we, albeit unconsciously at times, selected our homes for reasons deeper than liking it or not. It takes an expert in reading the energetic pathways created by the layout to help us sort out what brought us to this place we now call home and the thinking that created the lives we now lead. I presume you would not be reading this if your life were just peachy. A Feng Shui consultant is trained on precisely how to read the impact of the layout on our relationships, the careers and businesses we spend our time in, the state of our health, and how we learn. The home’s blueprint shows our ability to travel, our relationship to money and wealth and how we deal with authority and government. It tells of how we achieve recognition for our work and our lifestyle and it certainly speaks volumes on our relationships and partnerships. Our homes constitute the energy blueprint of our lives. When we are facing difficulties, we can start by healing our physical environment. It turns out that when we heal our homes, we heal ourselves. Answering the tough questions becomes easier when our environment is clean, organized and arranged to favor inner inquiry. Forgiving becomes easier when our space is balanced. Loving ourselves becomes easier when we are surrounded by things we lovingly selected and placed. Loving others is easier when we find inner peace within ourselves and it is supported by our living spaces. Thus, harmonious couples are easily formed because they are a vibrational match. When you enter these couples’ homes, you feel this vibration. Disharmonious matches are also easily seen in the homes they share. Today I intend to give you a crash course on how you could look at your home, focusing on relationships through the lens of Feng Shui principles to refresh an existing relationship, or to attract a good partner to your life. Feng Shui has been used for thousands of years in the Orient to arrange the best spaces for living, working and burial siting. It is now widely used throughout the world and as an interior designer; I have practiced and incorporated these principles in all the environments I created for the past 17 years, with enormous success. A prominent tool used in applying Feng Shui is an energetic grid called the Bagua. This grid is used as a guideline to follow how energy enters a space, how it travels through it and where specific vibrational areas are located that are stand-ins for nine life situations such as partnerships, wealth, fame, family, creativity and children, career, benefactors and knowledge and spirituality. The center, where all the areas converge, provides a gauge of the stability to the structure and its occupants. The center of a home or any other space holds the balance and health of the house and its occupants. 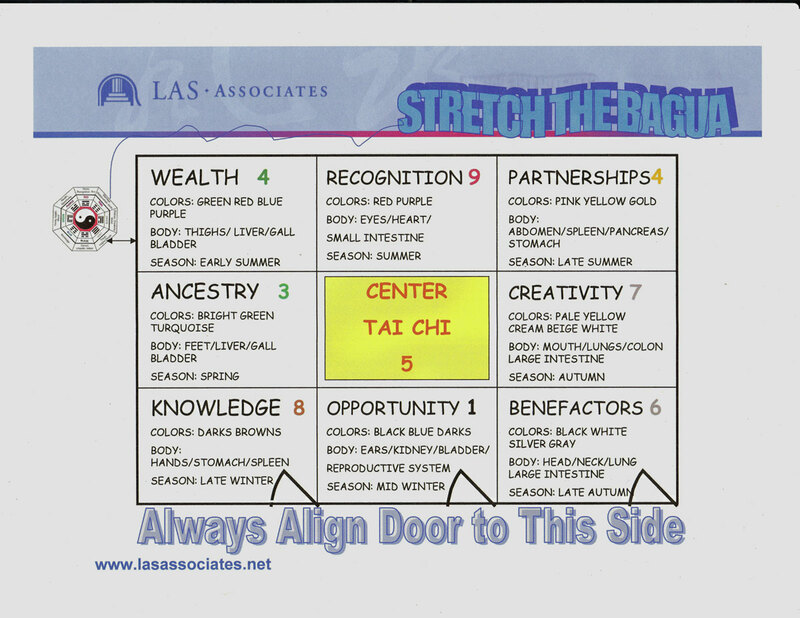 On the right is a Bagua grid showing the nine guas-the Chinese name for space, including all the energy attributes within each gua. The bagua is layered over the floor plan and aligns with the front door like a clock that can be stretched to match your home shape-see Feng Shui grid below laid on the floor plan. The front door will always be located at the 7:00 o’clock, 6:00 o’clock or 5:00 o’clock quadrants. The 1:00 o’clock quadrant will always represent relationship and partnership energy. The other areas are arranged as named on the grid. In honor of Valentine’s Day approaching, we will focus on the Partnership gua and examine how it reflects our lives. The floor plan on left shows a home with the bagua grid layered on. This plan tells us that the Relationship or partner’s gua is missing. So, if your love relationship is lacking energy or is simply lacking, your floor plan may mimic this L-shape one. A missing a gua lacks the energy represented by that gua. Living in this house, we may have trouble attracting relationships, or keeping them, our relationship with our mother may be strained, she may have died unhappy or we were crossed with her, and it may be difficult to have a good connection with our sisters. As a woman, we may feel unfulfilled, empty and unlovable. If a man lives in this house, he is lacking balanced female energy. Thus, he may not be able to hold on to relationships, and his relationships to women-mother, sister, friend, wife maybe unsatisfactory. If on the other hand, the house plan shows that the Partnership gua sticks out of the grid’s foot print; it may create an enhancement for the energy and life situation of that area. Then we are likely to find fulfillment in most of our relationships. However, when that enhancement is too large, then the energy is overpowering and it creates imbalances. Asian healing arts seek to create balance. When the female has too much power, men tend to be intimidated by it. If the Benefactors area sticks out, then the men will be too powerful and females will feel unrealized and unable to contribute. The Benefactors gua represents the male energy in the house plan. If missing, male energy is lacking. Reading the whole Bagua grid, you can see that the partnership gua represents the energy of earth and it relates to women, mothers, nurturing, receptiveness, diversity, stability, cooperativeness and marriage, among other things. It also has to do with the abdomen, the stomach, digestive disorders and the upper spine. So an imbalance in this area mirrors the same imbalance in the life of the home dweller. The houses that we inhabit do not create these life situations. We unconsciously gravitate to these structures because of our personal energetic blueprint. Our dwellings simply reflect our vibrational map. When we select where to live, we make a choice that may very well be unconscious, but a choice nonetheless. The ability to understand the energetic blueprint in our personal spaces allows us to focus on what does not function well in our lives and rejoice where all is well. We can save years of psychotherapy by uncovering these connections! It is worth noting that not all the occupants of the home will be experiencing the issues that the house presents to the same degree. Yet when the house is a vibrational match to one or more of the people’s personal energies, the effects are swiftly felt. Fortunately the art and science of Feng Shui offers what is called cures or adjustments. Much like the Ancient Asian healing medicine that it mirrors and supports, these cures balance the houses’ energies, so that its occupants, akin to the organs of the body, will be able to heal. Protected by the umbrella of Feng Shui adjustments, house dwellers may seek counseling, work on healing and growing spiritually, find new ideas and discover new understanding that will enhance their lives and move them further on their life journey. The floor plan on right presents some good adjustments for a missing Partnership gua. 1. Creating a seating arrangement for two in the bedroom or room, abutting the wall to the missing area. If it is not a bedroom, a mirror on that wall will create the sense of space and energetically pull in the missing gua. Do not place a mirror in front of a bed, as is the case with this layout. 2. If on the ground level, a garden with a seating arrangement as shown on the picture on right would also energetically include the missing gua. 3. If possible, a door opening in, such as in the garage shown on this plan creates a clear connection from the outdoor space to indoors. Every time you use the door, it reinforces the connection and every time you look out the window you get the same connection reinforcement. The floor plan shown here suggests many other life imbalances where all kinds of relationships and life situations can be at risk. Lest you think you are doomed with your L-shaped house, or any other poorly designed home, Feng Shui consultants can offer a myriad of adjustments. Some cures are as simple as changing the color of a room, adding or taking away art work and accessories, and re-arranging the furniture layout. Some remedies may be a bit more involved and some may entail spiritual space re-alignments that will best support your family’s healing. The most important take away I wish to leave you with is that the issues that guide people to select these places to dwell on a given time in their lives are visible in the home and Feng Shui knowledge and intervention can help, However, we cannot put live plants-a good Feng Shui adjustment for the family gua, and expect that a peachy relationship with your difficult grandparents will ensue. Plants will make things easier because you placed a symbol of new growth in this area and you placed it with your intention to focus on family issues. Your grandfather may be less cantankerous when you see him next, but the root cause that placed you in this relationship will still need to be addressed by you as you sit quietly near the plant. Adding a room in the relationship gua may bring you more partners as now you have brought this energy within your life, but you still have to address what belief is keeping you from attracting the right relationship. As construction goes on, or as you add particular adjustments, you will find it easier to contemplate these deeply buried issues. Awareness and self-examination are key. Exploring your relationship blueprint is focusing on each of the opportunities to heal difficult relationship within ourselves. In releasing what we no longer need you live love and therefore vibrate love. In exploring your home’s blueprint, see what is in disarray there. Notice the correlations for they will assist you to heal and release what you no longer need. You may not know all the possible cures or adjustments that are available through Feng Shui, but start by looking at where is the clutter and in what gua. Ponder, bring awareness. What are the rooms that just don’t feel right regardless of the gua? Fix; organize, clear up, vacuum, spruce up. As you clear up the guas, you feel clarity within you as well. Start where you are and don’t underestimate the power to change yourself and therefore your circumstances. At least do a thorough cleaning job and remove old stuff in your bedroom, change the sheets—I suggest you buy pink ones! You may change your partnership luck! Let me know what you like to read more about and I’ll try to deal with your subject matter. Thank you for your kind comments. I arrived here to be entertain, but I got just that, the only gripe is, I could convey more. Make sure you go on publishing. I beg of you. Your one as well as amongst the best of avid fans. P.S. please don’t stop right now ok, I managed to get you stroke up for more hehe.